Deathchase is a 1983 computer game written for the ZX Spectrum by Mervyn Estcourt and published by Micromega in the UK. In Spain it was published Ventamatic. 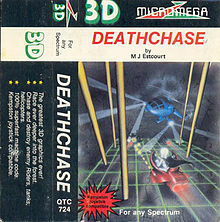 It is commonly known by the incorrect name of "3D Deathchase", perhaps due to the prominent "3D" on the inlay, and that some magazines incorrectly referred to this title. Timex USA obtained the rights to distribute Deathchase for its range of computers in the US. They rebranded the game Cyclepath but it was a commercial failure.